"Having a Wild Weekend" / "Dark Shadows" / "One Flew Over the Cuckoo's Nest" / "Like a Housewife" / "A Day at the Circus" / "Keep the Fire Burning" / "Dragon in Distress" / "There's No Place Like Home"
Excalibur battles Arcade and his Loonies. Issue #31: Excalibur is enjoying a quiet evening at home when Kitty's computer begins to act strangely. Suddenly, six bizarre beings emerge, calling themselves the Loonies. They attack and capture a surprised Excalibur, much to the delight of their imprisoned employer. Issue #32: Alone, Kitty encounters a massive cat named Rochester and discovers that he's a mechanical construct. Reprogramming him to go to sleep, she sets off to find whomever is responsible for the attack on Excalibur. Issue #33: Captain Britain awakens in a sea of alcohol and makes his way to a beach, where's he attacked by two earlier versions of himself. Meanwhile, Kitty discovers some kind of control room. 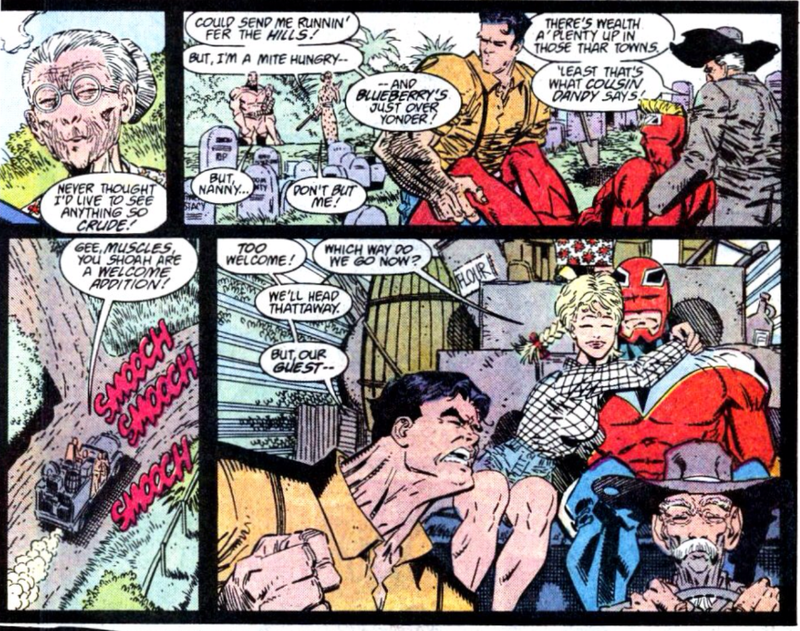 Captain Britain is then rescued by a family hillbillies, who give him a ride towards the town of Blurberry, where he meets the patrons of a bar called Sneers. But the real Captain Britain remains a captive of the Loonies, plugged into some kind of mind-altering helmet. Issue #34: Meggan awakens inside a strange house, populated by vaguely monstrous individuals who claim to be her family. Suddenly, a dragon appears, and after Meggan defeats it, everyone else disappears. Meanwhile, Kitty continues to fiddle with the computers as the Loonies realize their boss hasn't changed the plan and that someone is tampering with their system. 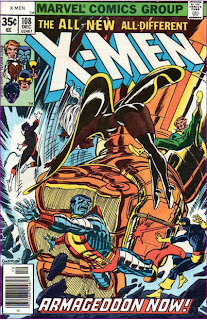 Issue #35: Nightcrawler wakes up in a circus cage. He's freed by a moose and a squirrel, but is eventually recaptured. 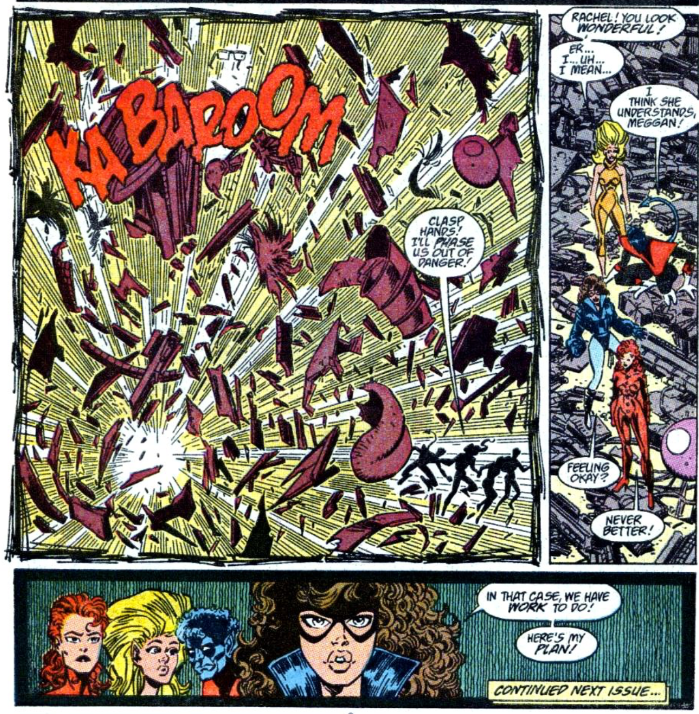 Meanwhile, Meggan reunites with Kitty inside the control room, and Kitty manages to rescue Nightcrawler just before a performer hits him with a knife. Elsewhere, Captain Britain remains trapped inside the simulation, walking down a yellow brick road and fighting off flying monkeys. Issue #36: Rachel finds herself face to face with the older version of Kitty from her future timeline, claiming Rachel is responsible for her death. Then Dark Phoenix appears and challenges Rachel to a lightsaber duel, and finally, a large bird named Tweedie attacks her, until the rest of Excalibur, riding the reprogrammed Rochester, rescue her. 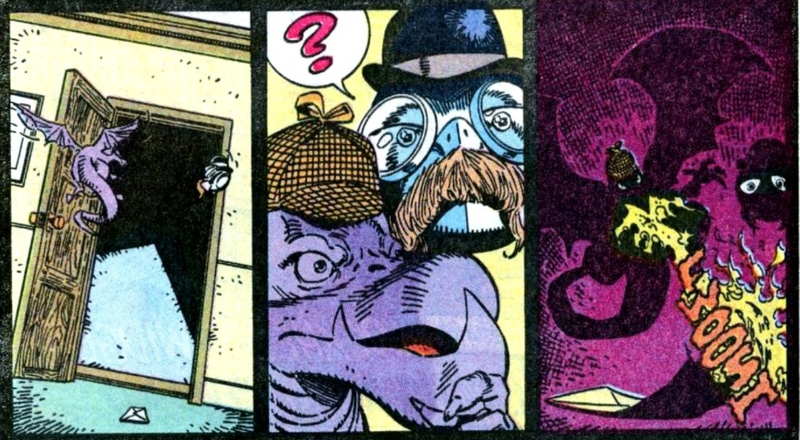 Issue #37: Widget and Lockheed awaken as detectives, and attempt to help a dragon captured by a dastardly villain. However, Agents 68 and 99.9 attempt to apprehend them for operating without detective licenses. Meanwhile, Kitty finds a way to merge Captain Britain's program with Lockheed and Widget's program, and causes the Loonies to fall asleep in a field of poppies. 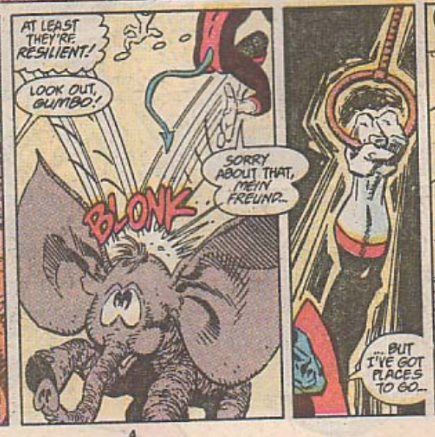 With all of Excalibur reunited, Captain Britain vows revenge. 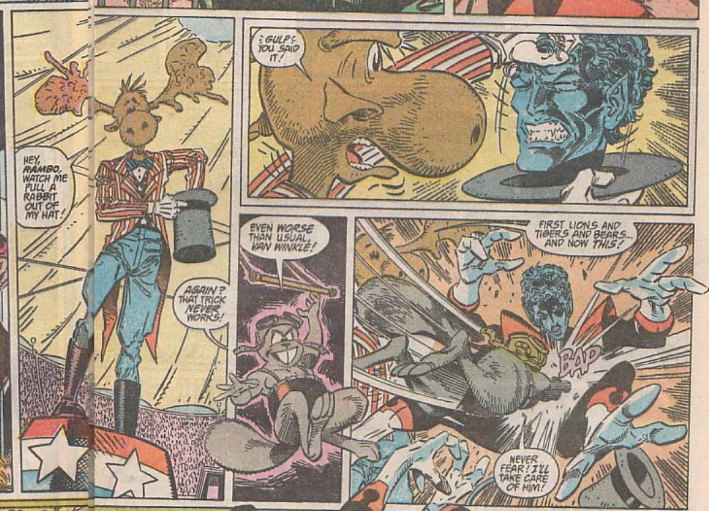 Issue #38: Excalibur, en route to the Emerald City, are attacked by Munchkins as well as the revived Loonies. Reaching the city, they discover the Loonies employer is none other than Arcade. Cornered by the Loonies, Kitty reveals her own programs, the Merry Maladies, who battle and defeat the Loonies, much to Arcade's dismay. Boarding a hot air balloon, Excalibur sets off for home. Arriving there, they agree they feel as though they've woken from a bad dream. 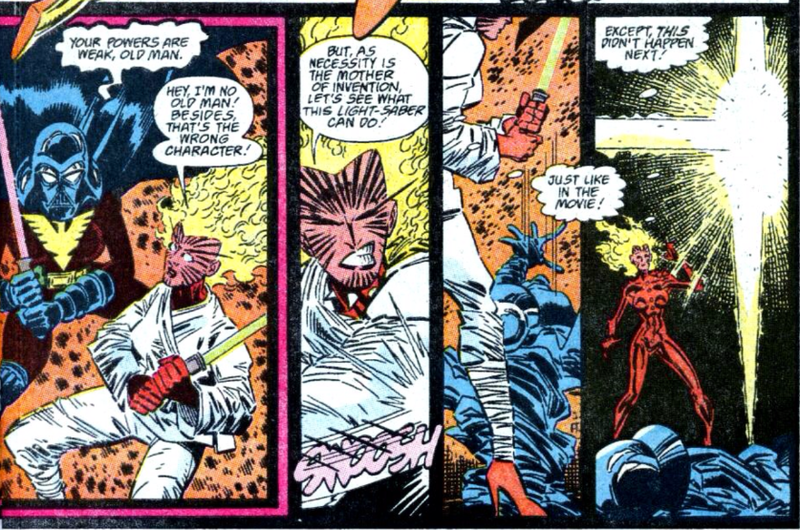 Though he doesn't actually appear until the final chapter, Arcade is the main villain of this story, as he targets Excalibur out of vengeance for his defeat at their hands when they met in Excalibur #4-5. 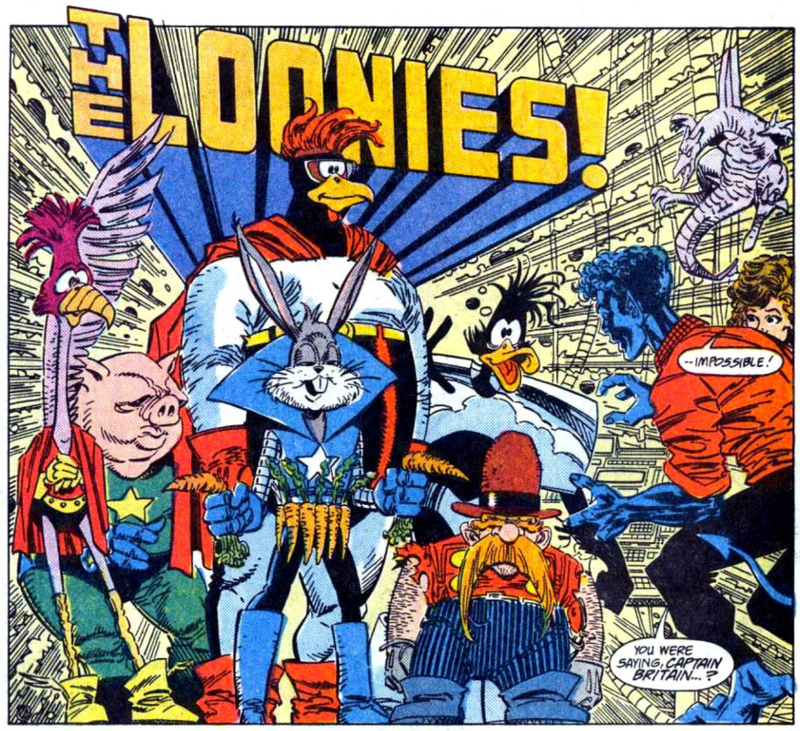 Issue #31 marks the first and, I believe, only appearance of the Loonies, characters modeled after Warner Bros. Looney Tunes characters (ie Bugs Bunny, Daffy Duck, Porky Pig, etc.) created by Arcade and used to extract his vengeance on Excalibur. Issue #32 features a done-in-one Sunfire story, to which there is not a lot, while issue #33 features a standalone Namor the Sub-Mariner story notable for being drawn by Jim Lee. Erik Larsen, who will make a name for himself penciling Amazing Spider-Man after Todd McFarlane leaves that title to launch the adjectiveless Spider-Man series, provides the art for this story. He is the last future Image co-founder we'll encounter before the Image Exodus in 1992 (though we've yet to see Whilce Portacio's pencils) and one of the three (along with McFarlane and Jim Valentino), to never work on a regular X-book before founding Image. 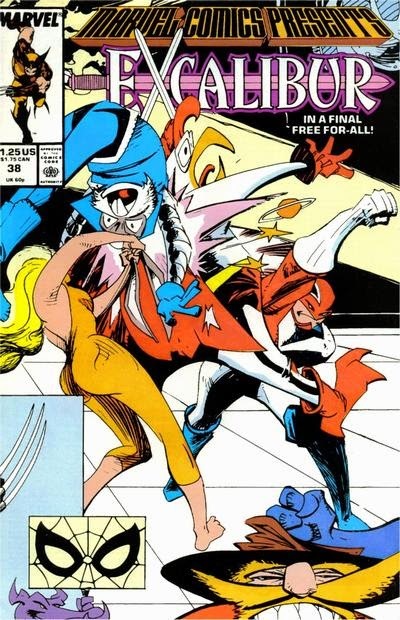 McFarlane provides the cover art to issue #32. UncannyX-Men.net places this story between Excalibur #8 and #9, while the Marvel Chronology Project places it all the way after issue #34. The later seems to work better, as there presumably wasn't much time between issues #8 and #9 for this to take place. 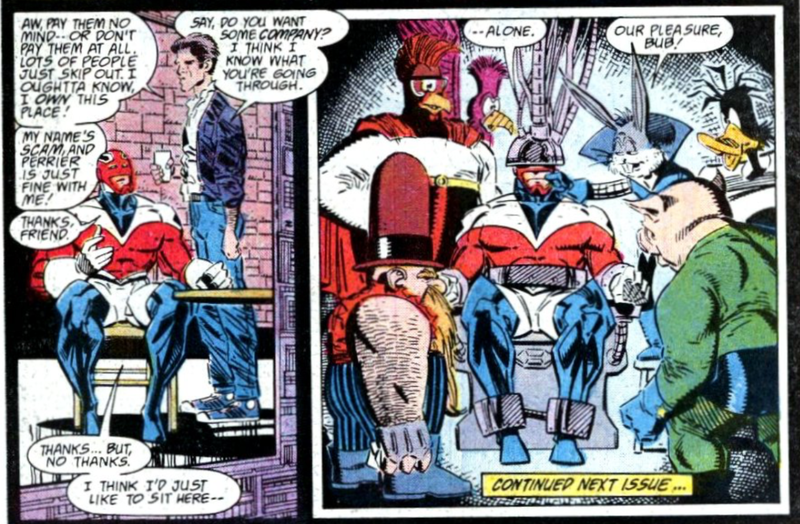 Though set after "The Cross Time Caper", Meggan is wearing her original Excalibur costume (the one she replaced with the green one during the aforementioned story). Similarly, Widget is shown to be a much more integral member of the team, sharing a chapter with Lockheed, than he actually was in contemporaneous issues of the series. Captain Britain, however, is wearing the new costume he received during "Cross Time Caper". In issue #38, Arcade says he's going to re-work his systems so Kitty can't tamper with it again, a reference to the last several times (such as X-Men #197 and Excalibur #5) in which Kitty took control of his systems and used them against him. For the most part, this story seems like little more than an excuse to drop Excalibur into a bunch of pop culture parodies, from Looney Tunes to The Beverly Hillbillies to Wizard of Oz. It works much better with Excalibur than it would had this featured some of the X-Men or X-Factor, since Excalibur as a series already has a much more whimsical tone that allows for these kinds of winking homages, and revealing Arcade to be the villain behind it all works too: he now has a history with the team, and as mentioned when he first tangled with him, Arcade is a much better fit as a villain for Excalibur than the other X-teams for the same reason the more parodical stories generally work better. The heavily serialized format of Marvel Comics Presents also works to the story's advantage. Splitting up the team after the first installment and essentially handing over each of the subsequent chapters to a different team member, as the group slowly comes back together, helps give each member of the team a chance to shine despite the abbreviated per-chapter page count (though the format of each chapter does grow repetitive, and the broken-up focus prevents much in the way of character arcs across the chapters). All that said, this is by no means essential reading. It's fun in a goofy way, and the presence of Arcade makes for a nice callback, but there's not much here besides the parodies, which grow tired quickly, and the actual mechanics of the story don't make much sense (Kitty goes from captured to free between issues #31 and #32 without explanation, for example). Like most of the Marvel Comics Presents serials thus far, it's mostly inoffensive, but also inessential. Wolverine goes native in The Jungle Adventure. I've never read this and I have no particular desire to, but I thought I'd comment on Erik Larsen. I've always been a fan of his art from the late eighties and early nineties. Over the years he's gone "full Kirby" and I just don't think it works for him. But his stuff around this period still looks very nice to my eye. Also, that's an incredible likeness of Ted Danson. I recognized him from the thumbnail before I even read your synopsis mentioning "Sneers". P.S. : Not to pick nits, but you spelled Todd McFarlane's last name wrong a few times. He's a "Mc", not a "Mac". Re: the chronology- I think the dragon in these stories is supposed to be the Train Dragon introduced in Excalibur 10, so this should go after the Cross Time Caper. Given that this storyline is essentially 2 normal sized issues when added up, I'm surprised they didn't just release it as Excaliber Annual #1. The Larsen art does nothing for me, never has and never will. But with Austin's inks, it does have an Art Adams feel to it. Interesting that the Excaliber story starts when the Havok story ends. While Wolverine isn't dominating the title the way he eventually will, it seems like the main story will always feature some X-character or X-team. "Interesting that the Excaliber story starts when the Havok story ends. While Wolverine isn't dominating the title the way he eventually will, it seems like the main story will always feature some X-character or X-team." I believe MCP was conceived and marketed as an anthology series that would flagshipped by X-Men solo stories. Um... exactly how long did Disney have the acquisition of Marvel in the works? Because the choice of villains has an air of someone jumping the gun a bit. Did Warner own DC back then already? "Issue #32 features a done-in-one Sunfire story, to which there is not a lot, while issue #33 features a standalone Namor the Sub-Mariner story notable for being drawn by Jim Lee. " Also: issue 38 features Part One of a new ten-part Wolverine serial. The second such serial to appear in MCP since the one that was in the first ten. Jason -- "The story, by Marv Wolfman, is pretty weak." Shameless plug: If you want to read about some comparatively strong Wolfman stories, look no further than my blog, where I've begun writing about the Wolfman/Pérez NEW TEEN TITANS. Which I assume regular readers had suspected. I don't get the constant teasing references to him as the "Joker" in charge, however, since only readers who didn't understand the difference between DC and Marvel would ever suspect it was actually The Joker. I have a special hate for lame parodies like the ones here. Archie comics did this a lot, with celebrities and brand names and TV shows. Marvel and DC both did it plenty of times just with burger joints not quite named McDonald's. They're not even parodies, really, more thinly veiled avoidances of trademark exploitation, and I admit that what we get here is sort-of halfway between that stuff and actual Mad-style spoofs even if there's no real level of parody beyond the name changes. It takes me so far out of the reality of the story/series, though, for characters to not reference actual real-world things in passing, and the inconsistency is equally maddening; George Lucas, Steven Spielberg, and their movies exist in this universe, for example. One bit that stood out for me was Rochester, who of course as one of the Loonies stands in for Sylvester, turning into Bill the Cat from Bloom County. Also, I found the names given to the analogues of Rocky and Bullwinkle's enemies Boris and Natasha pretty clever: Karloff and Romanoff. The notable thing about the art to me was how the middle of every chapter consisted of "widescreen" double-page spreads. Erik Larsen's stuff has never been a favorite of mine, but he certainly got better than he is here, and I did like the Defenders series he did with Kurt Busiek. 1969. You might've just typo'd it, although 1989 is when Time Warner happened by merger. Kinney National bought DC in 1967 and then the floundering Warner Bros. in 1969. I'm not sure if DC was directly in the Warner bloc before Kinney sold off its non-entertainment holdings and rebranded what remained as Warner in 1971. I'm really glad you're finally getting to read New Teen Titans and really sorry that I'm too swamped to play along right now. Like all of this X-Men stuff and everything else you've covered over there, it's definitely of its time, but it really was choice. The Wolfman/Perez run on Titans is one of my favorite comic book runs ever, so will def be checking it out. Blam: 1969. You might've just typo'd it, although 1989 is when Time Warner happened by merger. No typo, but crappy reading of DC wikipedia article combined to poor base knowledge and hasty jumping to conclusions. Thanks. It may have been the Batman movie of 1989 then that opened doors for some intercompany jabs, or not. Which would be of ironic hilarity too, fast-forwarding to Disney's acquisition of Marvel and how before that Marvel had unloaded film rights left and right for anyone who got the money. There was an early 90's legally mandated investor information... thingy that Marvel corporation chose to do comic book form that had the heroes speech bubbling up the financial records and whatnot, and the movie rights deals were already presented as a great thing in it. I think Marvel took the Batman thing hard at the time, and must really have been gutted when Batman Forever and especially Batman & Robin killed superhero movies for a while. What he said. As someone who's own last name is frequently misspelled, I tend to notice these things, too. At least Erik Larsen's name is spelled correctly. Way too many times I have seen "Eric Larson" creep into print. 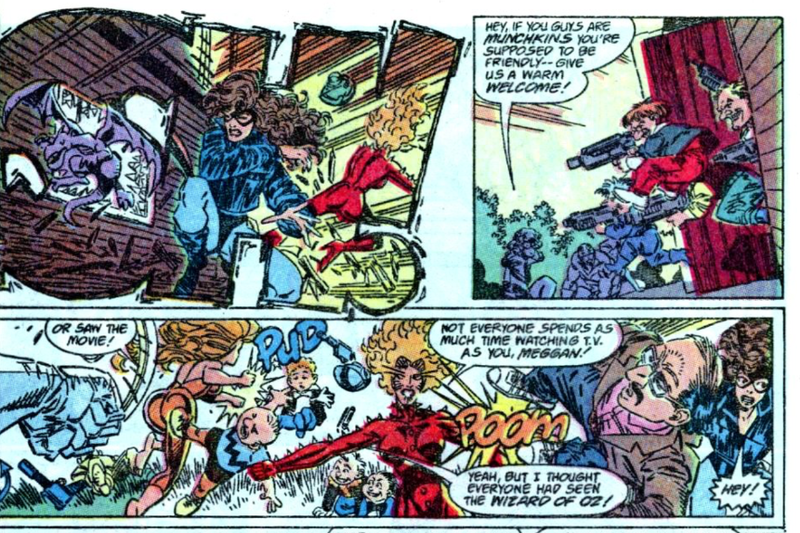 And, just to shoe-horn in another pop culture reference, I noticed one of the munchkins Meggan is punching in that last "Oz" panel is dressed like Charlie Brown. Jason -- "I will say for clarification that I have nothing against Marv Wolfman in general." Oh, I have nothing against him either. He's written some stuff I've liked and some I haven't. Honestly, I haven't read a ton of his work. I was just glomming onto the phrasing of your comment for my own insidious purposes. Blam -- "It takes me so far out of the reality of the story/series, though, for characters to not reference actual real-world things in passing, and the inconsistency is equally maddening; George Lucas, Steven Spielberg, and their movies exist in this universe, for example." I'm with you! 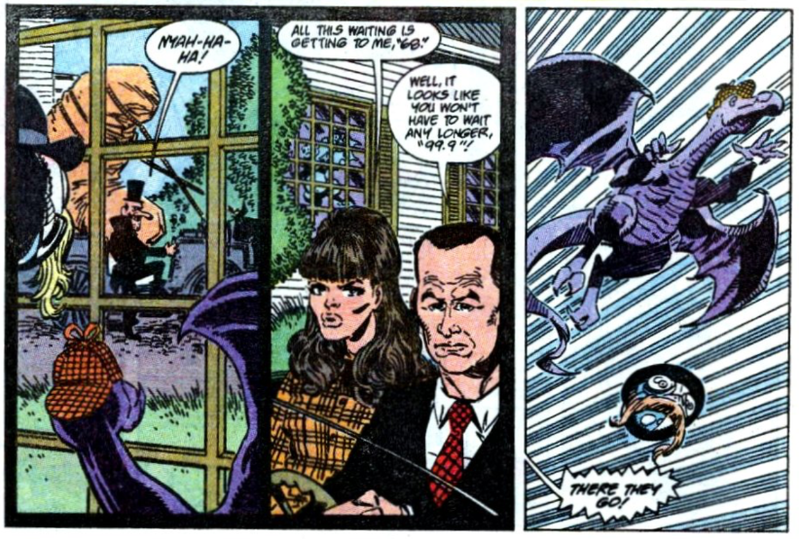 I think I mentioned it once before, but there was an issue of Erik Larsen's SPIDER-MAN where Mary Jane auditioned for a bit part part in an "Arnold Schwarzenheimer" movie. Thing is, I know Arnold Schwarzenegger has been name-checked in Marvel comics, too. There's no way he hasn't been. So does that mean that in the Marvel Universe, there is an actor named Arnold Schwarzenheimer and an actor named Arnold Schwarzenegger? It's silly. Blam -- "I'm really glad you're finally getting to read New Teen Titans and really sorry that I'm too swamped to play along right now." Stop by whenever you have time, and binge. I just started this week, and the posts will keep going, I think, through May. And the wonderful thing about the internet is, it'll be there forever and ever! wwk5d -- "The Wolfman/Perez run on Titans is one of my favorite comic book runs ever, so will def be checking it out"
"And the wonderful thing about the internet is, it'll be there forever and ever!" I still plan to go back and comment on all your Captain Britain blogs, the next time I do a re-read of those comics. "So does that mean that in the Marvel Universe, there is an actor named Arnold Schwarzenheimer and an actor named Arnold Schwarzenegger? It's silly." Yes. Larger number of German and Austrian immigrants to America -- the history of that part of Europe was altered ever so slightly during WWII, due to the existence of the Red Skull and Baron Von Strucker. I would so buy a Graphic Novel where both Arnolds and the dude from Avengers would star in the movie Herculi in New York. "Arnold Schwarzenheimer - Arnold Schwarzenegger - Hercules - in"
@Matt: I've always been a fan of his art from the late eighties and early nineties. I feel bad responding just to be contrary, but his art from this era does little for me. I don't dislike it, but it doesn't excite me, either. I probably prefer his more current, Kirby-inspired work (like Blam, I really dig his Defenders series w/Busiek), but even that I wouldn't say I *love*. Also, that's an incredible likeness of Ted Danson. Not to pick nits, but you spelled Todd McFarlane's last name wrong a few times. He's a "Mc", not a "Mac". If you want to read about some comparatively strong Wolfman stories, look no further than my blog, where I've begun writing about the Wolfman/Pérez NEW TEEN TITANS. Coincidentally enough, I just finished the first NTT archive volume not too long ago. I'll be over shortly to check out your reviews. @anonymous: I think the dragon in these stories is supposed to be the Train Dragon introduced in Excalibur 10, so this should go after the Cross Time Caper. Ah, I think you're right. That makes sense. @wwk5d: But with Austin's inks, it does have an Art Adams feel to it. I can see that, particularly in the close-ups (which, for the most part, I like more than the larger, medium and group shots). While Wolverine isn't dominating the title the way he eventually will, it seems like the main story will always feature some X-character or X-team. As others have pointed out, I think that was always true of the series. Eventually, it'll be Wolverine who keeps that streak alive singlehandedly, but even now, it's also some X-character (Wolverine, Colossus, Cyclops, Havok, Excalibur back to Wolverine). @Jason: Also: issue 38 features Part One of a new ten-part Wolverine serial. The second such serial to appear in MCP since the one that was in the first ten. Yeah, I should have pointed that, simply for it marking the return of Wolverine to the role of main feature in the book. The serial that runs from 38 to 47 is also noteworthy for being illustrated by John Buscema. But that's about the only thing noteworthy about it. The story, by Marv Wolfman, is pretty weak. Indeed. I decided not to cover it simply because there's really not much *there* there at all. Ok, that's a pretty great No Prize explanation for the presence of two Austrian bodybuilders-turned-actors in the MU. @Blam: I don't get the constant teasing references to him as the "Joker" in charge, however, since only readers who didn't understand the difference between DC and Marvel would ever suspect it was actually The Joker. Nor do I, which is why I never really mentioned it. I guess maybe it's just supposed to be another parodic/satirical element like all the references, but it's more subtle than the others, yet never really manifests into anything. It takes me so far out of the reality of the story/series, though, for characters to not reference actual real-world things in passing, and the inconsistency is equally maddening; George Lucas, Steven Spielberg, and their movies exist in this universe, for example. I'm with you and Matt. Either use the real world versions of such things, or thinly-veiled fictional stand-ins. Don't use both. Not being familiar with Bloom County, I missed that one. The notable thing about the art to me was how the middle of every chapter consisted of "widescreen" double-page spreads. I found that very annoying myself, though I'll admit that was probably more due to the scans I was reading (which didn't line up the two pages of the spread very well) than the effect or the art itself. @Teemu: I think Marvel took the Batman thing hard at the time, and must really have been gutted when Batman Forever and especially Batman & Robin killed superhero movies for a while. Definitely, though if Sean Howe's history of Marvel made anything clear, it was that Stan Lee/Marvel as a corporate entity was *constantly* trying to generate movie and TV deals featuring their characters, almost from the very beginning and mostly nonstop thereafter. There's a narrative that could be made of Marvel's history as a company (not the only narrative, but one of them) in which the success of Marvel Studios is the culmination of a 50 year quest to find creative and financial success adapting the Marvel characters for the big screen. @James: I believe MCP was conceived and marketed as an anthology series that would flagshipped by X-Men solo stories. The recent first volume of Wolverine's Epic Collection trade features an article from Marvel Age discussing the inception of the series and much is made of it being a chance to see Wolverine in long-demanded solo action (the same article also teases the launch of his solo series). I don't recall seeing anything else about it being created as a vehicle for other solo X-Men stories, but I wouldn't be surprised if that was mentioned elsewhere, as the X-Men were certainly popular enough at the time to warrant it. I meant "foundering". Damn spellcheck convinced me to switch it but I'm not making that mistake again. I do agree with you there, Teemu; I'm just skeptical that an Excalibur serial in Marvel Comics Presents by relatively unknown talents about various pop-culture touchstones, most non-Warner ones and none of them originally from comics, was venting that frustration. And Teebore's dead on. Much as I'm not a fan of cynicism, nor do I enjoy how much the comics world has long defined success as adaptation into bigger-budget media, I think that narrative has the bitter sting of truth. I'm planning to get my niece the first New Teen Titans Omnibus for a big birthday this year and I might read it first. Unfortunately my single issues aren't accessible right now, and the bookshelf with the Archives has boxes stacked in front of it as I rearrange office stuff. I did a full reread about a decade ago, which feels a lot more recent than it was. Anyway, I visit your blog in spurts but, like other Internet reading, often when I'm too tired to comment; I think I chimed in last on the Barr/Davis/Neary Batman and have other posts bookmarked to comment on, Hercules maybe, while I left off around the time you began Star Wars. Not that I won't skip ahead to Titans when possible. I should maybe clarify my position as wanting to dump the fictional stand-ins, period. When something's going to be an ongoing part of the story, okay, I understand and it could work, like Galaxy Broadcasting or Roxxon Oil, although I never liked Big Belly Burger. Otherwise spare me the offhand mention of, like, Helmut the Frog on The Poppet Show when the whole point is a fleeting cultural reference to ground the story in real-world cultural markers, because it's totally a narrative speed bump. I was judicious in my word choice because first and foremost it was odd enough to feel worth noting, but close behind that, yeah, it was annoying. Blam: "Unless you've stumbled upon what the "Joker" thing was about..."
Might be a jab at Claremont/Davis' possibly "too Joker-like" Arcade even, seeing that Davis very recently before had been drawing some Batman stories with Joker being Joker in them. WE know Arcade like this from Byrne/Claremont Captain Britain/X-Men but does Higgins or could it be some misaimed meta pointer at Arcade's "un-originality"? And now, having invested some time on uncannyxmen.net on the issues in question, may I just say that not making Rochester the cat a portmanteau parody of Sylvester AND Rorschach is a failed opportunity. He should have put out a couple of dogs too at some point, being a cat and all. 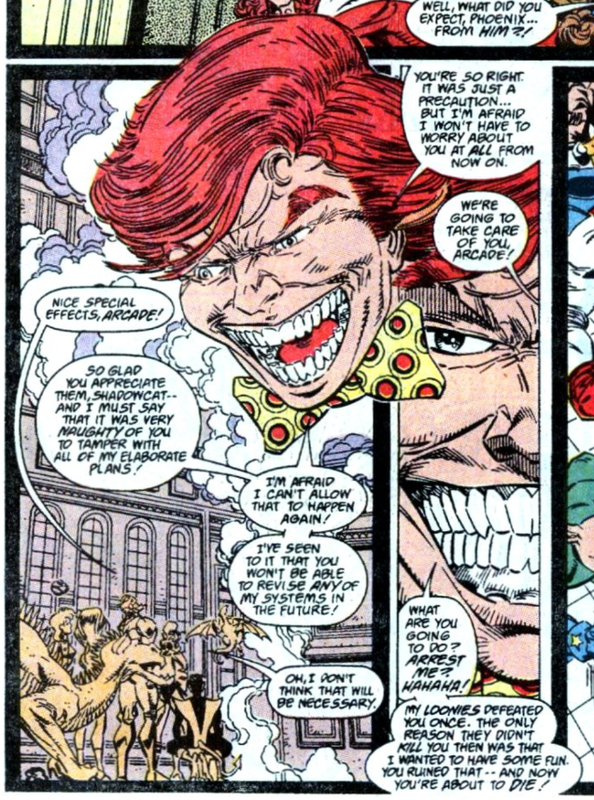 The continuous portrayal of the "joker" as a grinning resident of the Crossmoor prison playing a game is not too far from the other guy having a habit of being poorly constrained in the Arkham Asylum.